A couple of photos for you here. 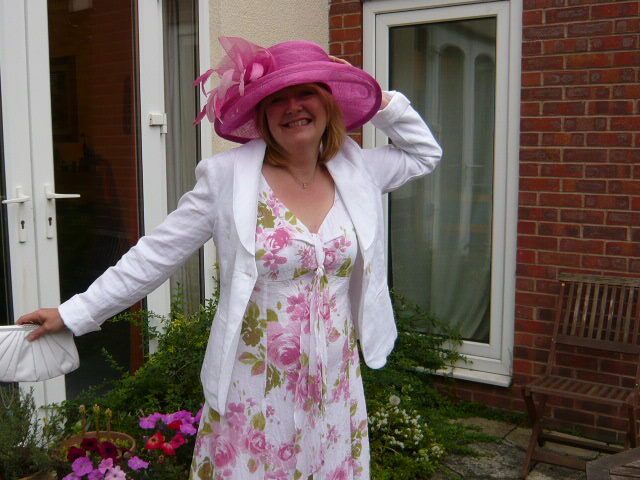 First is a nice sensible one of my daughter shaded from the bright sun by the fall of her hair, and the second is a daft snap of me modelling the hat that I wore when we were lucky enough to be invited by the Queen to a garden party at Buckingham Palace a few years ago. On the invitation it stated that headwear was compulsory for ladies, so I took the opportunity to get the biggest, pinkest hat I could find and it certainly kept the sun off my face! To be honest, I was more excited about wearing the hat than going to the party I think. Still we had a fab time and felt very posh indeed. This entry was posted in Photo Challenges and tagged photo, photography, shade, shadowed, shadows, weekly photo challenge. Bookmark the permalink. Garden party with the Queen? Wow. I didn’t know she did that. How do you get invited? Oh yes, she Invites a couple of thousand people at a time about three times a year (I don’t think she makes all the sandwiches herself 😉) so it’s not that exclusive, but still quite exciting for us. we got invited through my husbands work with a health board. What fun! And I love your hat!